Fundraising expert Kim Klein has trained thousands of groups and individuals to cultivate assets that make good works possible. In this peer-led program, she presents the core methods of fundraising simply and directly. Designed for use with the Leader Manual, this book facilitates learning with facts, charts, and planning aids. By the final training session, your team will have a comprehensive strategy for integrating its fundraising vision with its deepest values and commitments. Fundraising expert Kim Klein has trained thousands of groups and individuals to cultivate assets that make good works possible. The Ask and You Shall Receive training package is a do-it-yourself, start-to-finish program on jumpstarting fundraising efforts. 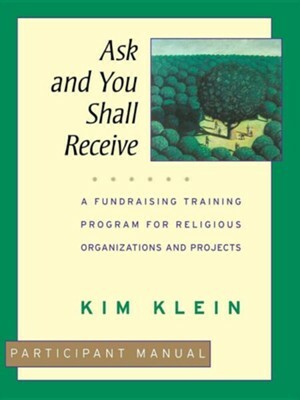 A peer-led program designed for use with its companion Participant Manual, the Ask and You Shall Receive Leader Manual walks you through the most common fundraising scenarios with dependable information, methods, prompts, and preparation guidelines. Realistic time allowances keep the training within reach of busy volunteers. KIM KLEIN is an internationally known fundraising trainer, speaker, and consultant. She has worked in religious and secular settings as a staff member, board member, and volunteer. She is co-owner of nonprofit publisher Chardon Press, and author of Fundraising for the Long Haul and Fundraising for Social Change, which is now in its fourth edition and widely used as a textbook. Founder of Grassroots Fundraising Journal, she also has a popular video series on fundraising. "Good works rely on good work, and Kim Klein's careful guidance inbuilding support for good works really helps us in the religiouscommunity do the work we intend to do." --The Reverend Hugh Wire,fundraising consultant, and board chair for fundraising, Seeds ofLearning. I'm the author/artist and I want to review Ask and You Shall Receive Workbook.